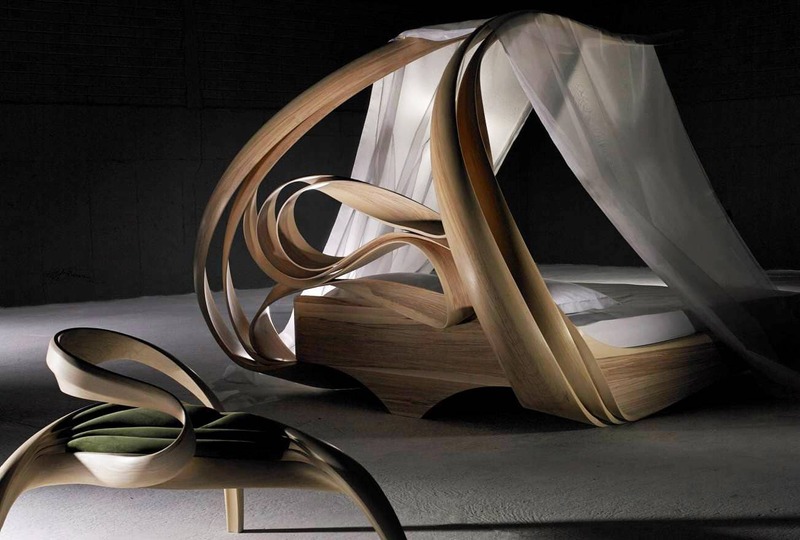 “Enignum” Canopy Bed and Two-Seater by Joseph Walsh IRE, 2014. Olive Ash silk organza. 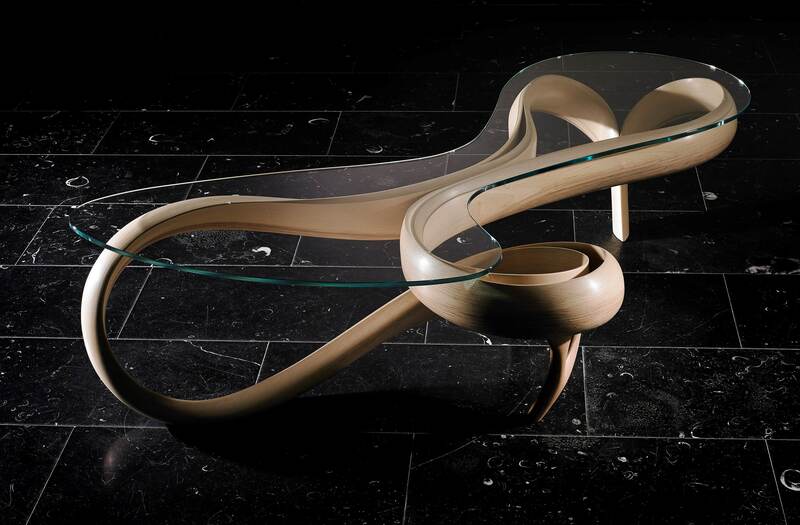 “Enignum III” Low Table by Joseph Walsh IRE, 2014. White Oiled Ash and Low Iron Glass. “Hostile Nature” by Beth Katleman, USA, 2014. 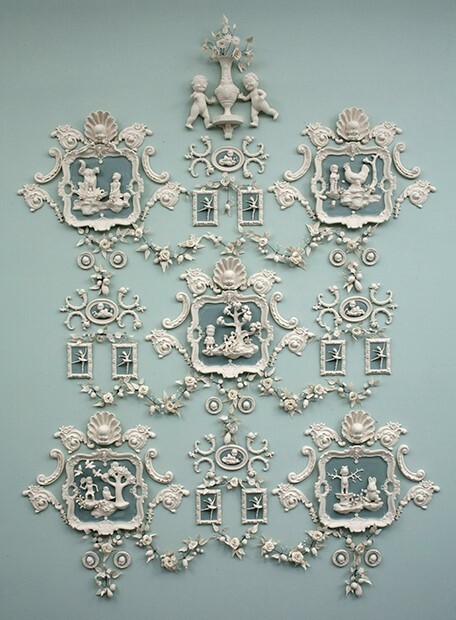 Porcelain wall mounted installation. “Binary III” by Niamh Barry, IRE, 2014. 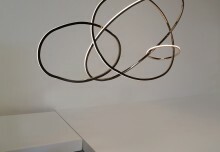 Brown patinated and mirror polished hand formed solid bronze, opal glass and LED lights. “Recite” by Molly Hatch, USA, 2014. 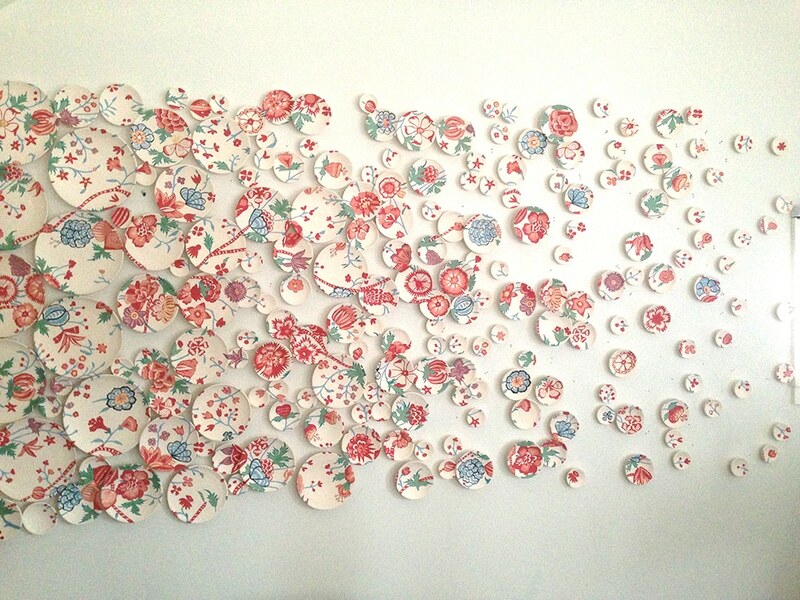 199 hand-thrown porcelain plates with glaze and under glaze, acrylic paint, hardware. 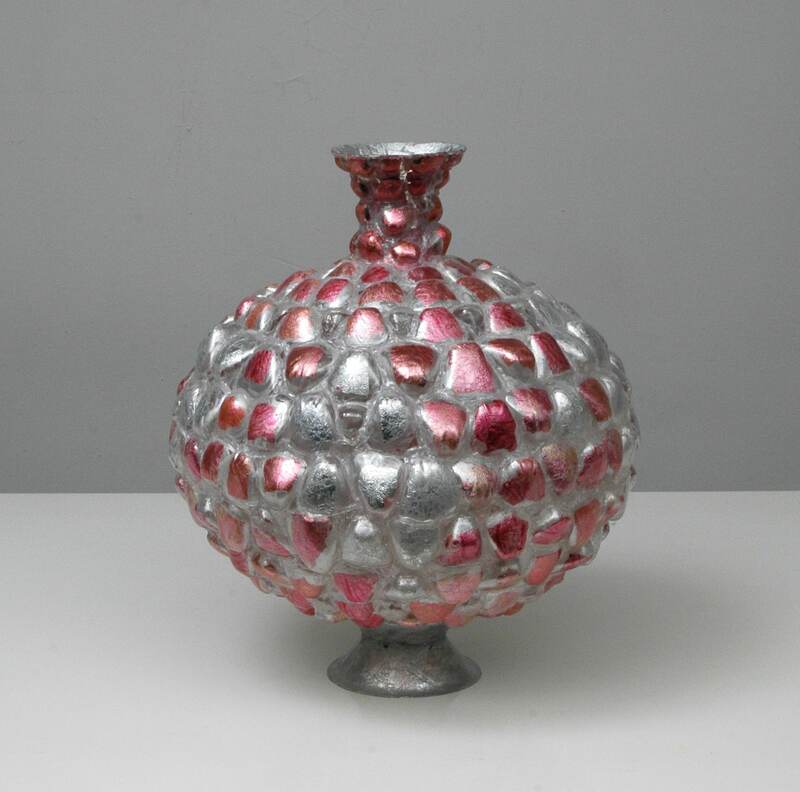 “Silver and Pink” by Shari Mendelson, USA, 2014. Plastic, hot glue, acrylic polymer, resin and paint. 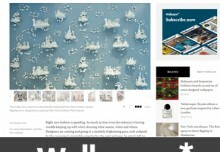 EXHIBITING AT COLLECTIVE.2 DESIGN FAIR, MAY 8 – 11, 2014. Todd Merrill Studio Contemporary is pleased to be participating in the annual Collective.2 Design Fair, at the Moynihan Station in New York from May 8- 11, 2014. 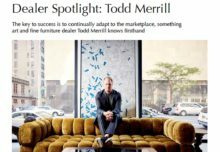 Merrill’s booth will showcase important new work from Studio Contemporary artists Joseph Walsh, Niamh Barry, Beth Katleman, Molly Hatch, and Shari Mendelson. The centerpiece of the booth will be Joseph Walsh’s Enignum Bed and Enignum III Low table. Created as the central focus within a suite, the Enignum Canopy Bed is positioned on a raised platform with Beth Katleman’s three-dimensional porcelain wallpaper Hostile Nature as a back-drop. The monumental bed is part of Walsh’s Enignum series, and is made of strips of Ash-wood manipulated into think layers and constructed and carved by Walsh into a massive free-form sculpture. 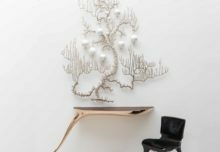 Autodidact Walsh opened his studio in Co. Cork, Ireland in 1999 and has since built a reputation for himself as one of the most interesting and complex furniture-makers working today. His work is in the collection of the Duke of Devonshire, Chatsworth House, England, the National Museum of Ireland, Dublin, Ireland, The Mint Museum in Charlotte, North Carolina, the Museum of Arts and Design, New York and was most recently featured in “Against the Grain: Wood in Contemporary Art, Craft, and Design” at the Museum of Arts and Design in New York, NY and “Modern Makers” at Chatsworth House, England. Walsh’s solo exhibition will be on view at the New Art Center, Roche Court in Wiltshire England from June 2014. “In the Enignum series of work, I have stripped the wood into thin layers, manipulating and reconstructing them into free form compositions. I then shape through these layers to reveal not only the honestly of the structure but the sculpted form which is a unique collaboration of man and material. The title derives from the Latin words Enigma (‘mystery’) and Lignum (‘wood’), for me they sum up the series; the mystery of the composition lies in the material.” Joseph Walsh. Beth Katleman will exhibit her most recent large scale creation, Hostile Nature, a wall-mounted porcelain narrative inspired by opulent 18th century print-room wallpaper from the collection of the Victoria and Albert Museum in London and Wedgewood rendered in three-dimension. The first time you see Hostile Nature, you feel as though you have returned to a place that is familiar and comforting, a refuge of creamy white porcelain. With its delicate scrollwork, garlands of flowers and framed allegories in teal and white porcelain, Hostile Nature evokes a world of genteel pleasure only to reveal a more subversive agenda upon close inspection. Katleman has developed a mix of contemporary pop culture and slightly warped narrative that is all her own. The pastoral scenes are populated with figurines cast from her collection of flea-market treasures, icons from popular culture and a profusions of delicate handmade roses. The ambiguous narratives contain hints of misbehavior: a boy with a banjo serenades a giant rooster, a sailor boy encounters a bikini clad siren guarding her treasure, and a pig-tailed girl with a tennis racket fights off a flock of menacing birds. Gentle woodland creatures appear here in a less wholesome guise in what Anthony Haden Guest has deemed Katleman’s naughty Acadia. 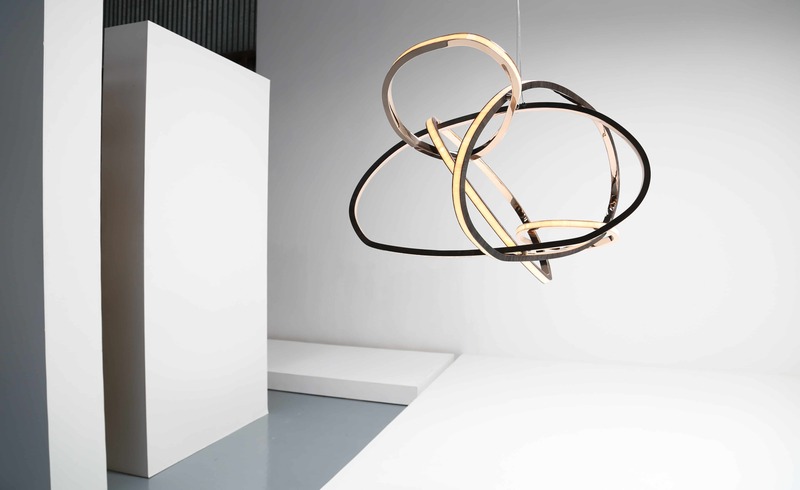 Light sculptress Niamh Barry’s installation, “Binary III” (2014), made of mirror polished hand formed solid bronze, brown patinated textured hand formed bronze, opal glass and dimmable LED lights, will be making its US premiere at the Collective.2 Design Fair. The ‘Binary’ series makes reference to a system of two objects in space which are so close that their gravitational interaction causes them to orbit about a common center of mass. Molly Hatch’s Recite is the first in a new body of work–a collaborative exploration of the textile and wall covering collections at the Smithsonian Cooper-Hewitt, National Design Museum in New York. After looking through the archives of the Cooper-Hewitt collections, Molly was inspired to work with an 18th century floral textile as the source imagery for Recite. Exploring how the eye reads surface pattern, she has deconstructed the repeat pattern by highlighting select floral motifs on the surface of hundreds of porcelain plates. Riffing on the historic as a musician may riff on a musical score, Molly offer Recite as her contemporary reinterpretation of this historic pattern. Molly recently unveiled a monumental wall installation at the High Museum in Atlanta, GA comprised of 500 hand-painted porcelain plates, at 22’ x 17’ “Physic Gardens” is her largest and most complex work to date. Shari Mendelson is premiering her newest series of hand-made sculptures constructed out of discarded plastic bottles and inspired by ancient vessels. Her interest lies in the balance between emulating the ancient objects and creating original sculptures. While studying ancient vessels, Shari considers what they were used for, the people who made them, and what the culture of their time was like. She then ponders what the remaining objects from our time will say about us to future civilizations – other than that we created huge amounts of plastic trash. Back in the studio, Shari reinterprets these ancient objects using discarded plastic water, soda and juice bottles, which are cut into pieces and hot-glued or sewn into new plastic sculptures. At first glance her work may look like the glass or ceramic on which it is modeled, yet upon closer look, a logo, recycling stamp or expiration date reveals the actual material. Mendelson’s work was recently acquired by the MFA Boston for its permanent collection.